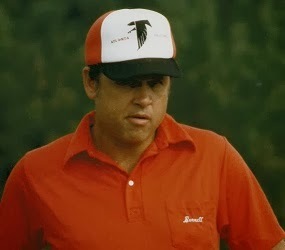 On February 3, 1977 the Atlanta Falcons announced the hiring of Leeman Bennett to be the team’s head coach. Bennett was given a five-year contract by GM Eddie LeBaron, the ex-NFL quarterback-turned-lawyer who was himself a recent hire. Bennett was hired after Dallas assistant coach Dan Reeves turned down the job. The 38-year-old Bennett (he turned 39 prior to the start of the ’77 season) had not previously been a head coach and most recently was wide receivers coach with the Rams. He had previously been an assistant with the Lions and Cardinals, and before that was a college assistant at Pittsburgh, Cincinnati, and Navy. The native of Paducah, Kentucky had played quarterback and defensive back in college at Kentucky. Since entering the NFL in 1966, the Falcons had finished with winning records in just two of eleven seasons. In 1976, they ended up at 4-10 with Head Coach Marion Campbell falling by the wayside five weeks into the campaign and then-GM Pat Peppler, who had last been a head football coach at the high school level in the 1940s, finishing out the year. While the Falcons upset the Cowboys along the way, they also were thrashed by the expansion Seahawks and were shut out three times, with the Rams annihilating them by a score of 59-0. To be sure, promising second-year QB Steve Bartkowski had gone down with a knee injury five weeks into the season and it was the likes of Kim McQuilken and Scott Hunter directing the offense the rest of the way. Bartkowski was still not around at the start of the 1977 season and, when he finally returned, he struggled. 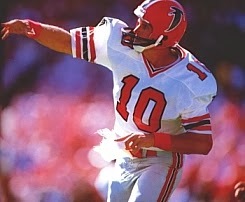 Just as in ’76, the offense was a problem area for the Falcons, but the story was not all bad. RB Haskel Stanback had a good year, rushing for 873 yards and catching 30 passes for 261 more. TE Jim Mitchell was a fine player, despite an off-year in ’77, while wide receivers Alfred Jenkins and Wallace Francis were capable. The line was young, but anchored by solid center Jeff Van Note. As much as the offense was a problematic work in progress, the attacking “Grits Blitz” defense was brilliant, setting a league record by giving up just 129 points over the course of 14 games. DE Claude Humphrey led a pass rush that recorded a team-record 42 sacks. The linebacker corps was a good one, with MLB Ralph Ortega flanked by Greg Brezina and Fulton Kuykendall (aka “Captain Crazy”), and the backfield had a star in CB Rolland Lawrence, who accounted for seven of the team’s 26 interceptions (also a club record at the time). The final tally was 7-7, which reflected favorably on Bennett and LeBaron and boded well for the team’s future. In 1978, Atlanta took another step upward. The trajectory didn’t appear to be moving that way when the team lost three consecutive games after beating Houston in the season-opening contest. The Falcons were 2-4 before posting five straight wins and seven in their last ten contests – some of which were in dramatic fashion – to finish second in the NFC West and thus qualifying as a Wild Card team in the playoffs. Bartkowski (pictured above), who lost his starting job to backup June Jones for the first three games, finally broke out and had a good season. Wallace Francis caught 45 passes for 695 yards and, when Alfred Jenkins was lost for the year in the first week, WR Billy Ryckman stepped in and had 45 catches for 679 yards. The third wide receiver, rookie Alfred Jackson, brought needed speed and averaged 20.2 yards on his 26 receptions and Jim Mitchell bounced back with 32 catches and displayed his usual skill at blocking. Haskel Stanback had a lesser year running the ball and HB Bubba Bean led the club with 707 yards on the ground. The defensive line lost Claude Humphrey, who quit the club four games into the season (he was traded to the Eagles afterward), and he proved hard to replace. But Greg Brezina provided leadership as well as good play at linebacker along with Fulton Kuykendall. Rolland Lawrence and CB Rick Byas performed ably and rookie safeties Frank Reed and Tom Pridemore were valuable additions. Perhaps the most inspiring addition of all was placekicker Tim Mazzetti, a bartender in Philadelphia when the season began who had failed to catch on with other teams, but who was picked up by the Falcons six weeks into the schedule and not only provided an inspiring story but came through with 13 field goals in 16 attempts, some of which were crucial in winning close games. Hosting their first-ever postseason game, the Falcons characteristically came from behind in the fourth quarter to edge the Eagles by a score of 14-13 and then fought hard against the powerful Dallas Cowboys in the Divisional round before succumbing 27-20. Overall, the season was considered a success and the combination of LeBaron and Bennett received praise. However, Bennett himself suggested that the good luck in close games could not be expected to last, and that there was still building to be done. Such became apparent when the Falcons slipped to 6-10 in 1979. Steve Bartkowski suffered from inconsistency and, while his overall numbers improved, he also tossed 20 interceptions. Tim Mazzetti attempted 25 field goals and was successful on only 13. More significantly, the defense that had performed so ably in 1977 and ’78 dropped to 25th overall in the NFL and gave up 388 points as opposing teams became more adept at coping with the blitzing scheme and began to burn the Falcons through the air. There was good news, too, as Alfred Jenkins returned from his injury and performed well (50 catches, 858 yards, 17.2 avg.) and Wallace Francis had another big year (74 catches, 1013 yards, 13 TDs). Rookie FB William Andrews proved to be an outstanding all-purpose talent, rushing for 1023 yards and catching 39 passes out of the backfield for 309 more. After overachieving in 1978 and underachieving in ’79, the stage was set for an outstanding year in 1980. The Falcons won the NFC West with a 12-4 record that reflected tremendous improvement on both sides of the ball. Bartkowski was consistent and outstanding in a year that saw him pass for 3544 yards and lead the league with 31 TD passes. Jenkins and Francis were again productive and were joined by rookie TE Junior Miller, who contributed 46 catches for 584 yards and nine touchdowns. William Andrews proved that his rookie performance was not a fluke as he gained 1308 rushing yards and 456 more yards on 51 pass receptions. HB Lynn Cain added 914 yards on the ground. Bartkowski, Jenkins, Miller, and Andrews were all selected to the Pro Bowl. On defense, an influx of key rookies and second-year players made a significant difference in overall performance. Two of the newcomers, linebackers Al Richardson and Buddy Curry, received Rookie of the Year honors and second-year OLB Joel Williams (pictured at right), an unheralded player picked up on waivers in ’79, accounted for 16 sacks (unofficially) while blitzing from the outside. It was a young unit, with four rookies starting by the end of the season, but the newcomers proved valuable. In the postseason, the Falcons faced Dallas in the Divisional round and suffered a heartbreaking defeat when the Cowboys came from behind in the fourth quarter. The expectation for 1981 was that that Falcons would be contenders once again. The offense responded by putting up 426 points, second most in the NFL, and Bartkowski, Andrews, Jenkins, and Miller all returned to the Pro Bowl while Francis and Cain continued to be key contributors. The line was outstanding. However, the defense regressed. 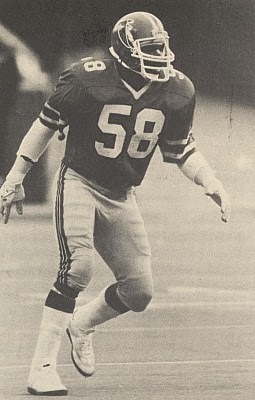 Joel Williams was lost for a significant portion of the year with a knee injury, and that had an effect on the pass rush, which recorded 29 sacks in comparison to 46 in 1980. NT Don Smith played well on the line, and Tom Pridemore returned his 7 interceptions for a total of 221 yards, but overall the Falcons gave up more passing yards than any other NFL team. After winning their first three games, the Falcons lost their next three and remained inconsistent for the rest of the way. They finished with a disappointing record of 7-9, with many of the losses coming in close games – they lost seven contests by a total of 19 points. LeBaron and Bennett looked to fine-tune, rather than overhaul, the team for 1982. In a strike-interrupted season that limited the schedule to nine games, Atlanta got off to a 5-2 start before collapsing in the last two contests and finishing at 5-4. The defeats were bad ones, 38-7 to the Packers and 35-6 at the hands of the Saints. They still qualified for the revised playoff format, but lost to Minnesota in the first round in a game that was not as close as the 30-24 score would suggest (none of the points were produced by the offense). The result was Bennett’s dismissal after six years. The low-key coach lacked charisma, but was knowledgeable and organized, and brought the Falcons to a new level of success. Ultimately, however, he paid for the team’s inconsistency and unevenness of that success. His overall record was 46-41 in the regular season and 1-3 in the playoffs. After two years out of football, he was hired by the Buccaneers to be head coach in 1985, but had far less success than in Atlanta and lasted just two years. The Falcons hired Dan Henning to replace Bennett with the hope of moving up to the next level, but he failed to post a winning record in four seasons. In fact, Atlanta would not finish above .500 again until 1991, when the Falcons also next reached the playoffs. In retrospect, Bennett’s accomplishments, however checkered, came to look all the more impressive.